Zion National Park sits right at the top of my most favorite National Parks. The unbelievable canyon that has been carved by the flowing Virgin River is one of the most tranquil, serene, and visited places in the United States National Park System. Red sandstone is contrasted against lush green trees and hanging wildflowers in the summer, brilliant fall foliage in autumn, and bright spring blooms just after the snow melts in April-June. Often named as one of the best hikes in the world, the Zion Narrows taper down to just a distance of nearly 20 feet wide at some points, while the canyon still shoots 2000 feet into the air. The park also contains some incredible places to stay just outside the park in Springdale. This small town is just a mile or two from the park entrance, and has some great restaurants and amazing scenery all around, so you'll have some sightseeing even while in your hotel. Zion National Park Paul Kehrer under CC 2.0. - The park has endangered peregrine falcons nesting in the park. - Zion was set up as a National Monument in 1909. - It was designated a National Park in 1919. - The Kolob Canyons contain the world's largest natural arch, Kolob Arch. - Zion Canyon is 15 miles long, as much as 1/2 mile wide, and as little as 20-30 feet wide. - Humans inhabited Zion as far back as 8000 years ago. 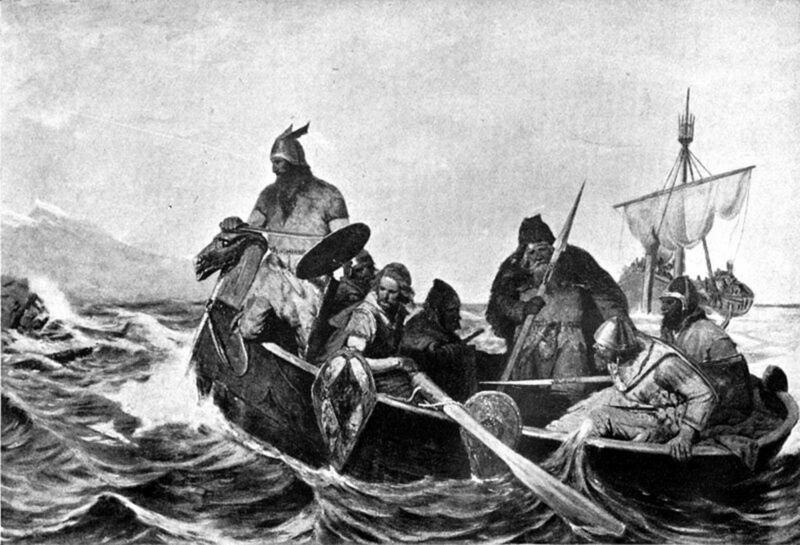 - European settlers first came to the park in 1776. 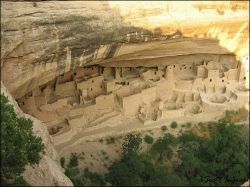 - Mormon farmers were the first Europeans to inhabit the park in 1847. - The Zion-Mount Carmel Tunnel was constructed by 1930, making the park much more accessible and visited. - 90 million years ago, the park was underwater and has shifted over time to where it currently is located through plate tectonics. - Zion is part of the massive Grand Staircase of the southwest. - The east entrance of Zion is only 72 miles from Bryce Canyon National Park. Zion lies at the merging of three dry desert zones of southern Utah, which means its hot in the summer, and very cold in the winter. 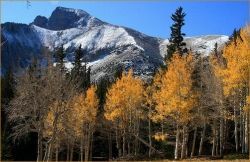 Most people agree, that the most scenic times of year in the park are spring and fall. The spring foliage offers vibrant yellows and greens against the striking earth tones of the valley walls, and cool, comfortable temperatures for hiking. The Virgin River is also heavier during this time of year. The fall months at Zion are also cool, but dry, and the autumn foliage hits peak. Fall foliage hits early in late September here, and you'll also miss those crowds. Past October, and you can expect a possible snowstorm in Zion. The contrasting colors of the old trees of Zion against the flowing Virgin River and the dark reds and browns of the canyon will stick in your brain forever. The best time of year to visit the Narrows area of Zion is also in early fall/late summer, when the Virgin River has finally died down and is able to be hiked. You can read more about the best time of year to visit Zion on this thread on Trip Advisor. Are you leaving Utah high and dry? This amazing state has a huge concentration of National Parks in a small area, and one of the most unique cities in America, Salt Lake City. Find the best roads around Zion, Arches, Canyonlands, Bryce Canyon and throughout the entire state with this awesome road guide. To see the sites along much of the Virgin River and inside Zion, you need to take a bus from Springdale, which is free and operates daily. Private vehicles are not permitted from April-October. Zion on Google Maps - Zoom in or out to see more/less detail! 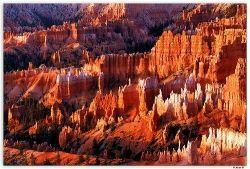 Southern Utah and the Zion-Bryce region are unlike other regions in the United States in the fact that there are so many National Parks and sites within a small area, it's a good idea to do some research and to have an-hand guide with you to find the best that each area has to offer. These books will give you a greater understanding of the beauty of Zion, from breathtaking photography to once-in-a-lifetime hikes that you'll remember forever. Videos Featuring Mini Tours of Zion National Park - Take a tour from your computer! It's the next best thing to being there, so you'll have to settle for these videos until you can get there again! Hand picked for their great content and imagery, take a virtual tour before you plan your trip to see if this is something you'd like to see in person. These two parks are often lumped together by book publishers for their proximity to one another, and it only makes sense. A trip to one is perfectly complimented by the other. Under time constraints, you can easily see both parks in just a few days. 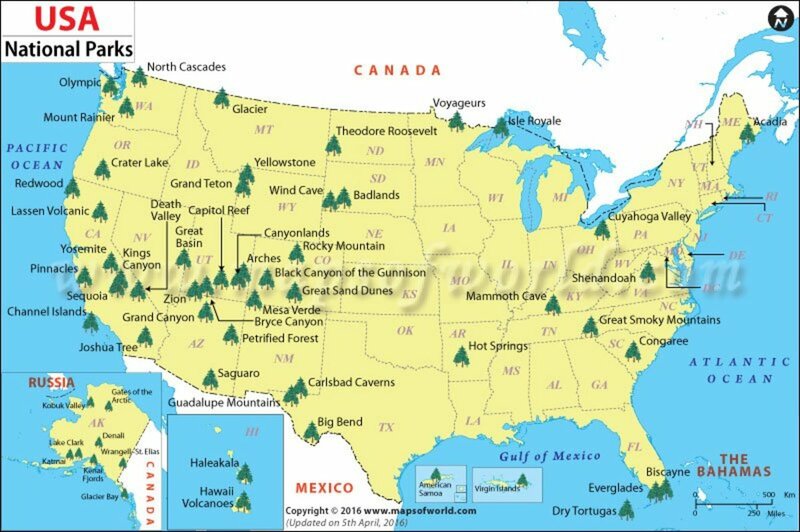 This guide will tell you some of the best places to see, the best hiking, from easy to those that want to get a full workout, places to avoid, times of year to avoid, it will give you some illustrations, and best of all, this guide is perfect to take with you and just the right size for travel. The Narrows section is one of America's greatest hikes. Is it THE greatest? 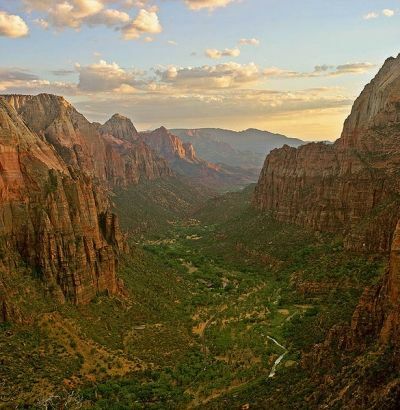 Find information on this extraordinary hike through Zion here. Photos of the beautiful Narrows, which shows off the gorge walls and uniqueness of it. Find out where to hike, when to hike, and more about the hanging gardens, skinny gorges, and spectacular grottos of the Narrows. All of the general technical stuff about the Narrows section, generated by the Wikipedia contributors. 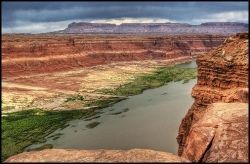 The three ways that you can visit the Narrows, which are bottom up, top down, and top down overnight, according utah.com. Weather forecasts, flash flood potential ratings, and stream reports are available at the Zion Canyon Visitor Center, (435) 772-0170. Permits are not issued when the flow is greater than 120 cubic feet per second. Flash floods do occur! Be prepared and stop by the visitors center before any hike. Equipment You'll Need for Hiking The Narrows - Zion's famed Narrows section: hike it! You'll need equipment like dry bags, neoprene socks, emergency overnight gear, water, and water shoes to make your trek through the Narrows. It's not an easy hike, it can be slippery, and can have some sections of heavy currents. You'll need to swim for short sections, and you'll need a couple of hiking sticks to make it through. Sounds strenuous, right? The views you'll receive along the way and in the Narrows will make it totally worth it. Plus, think of the story you'll have for the rest of your life! Keeps your feet dry and comfortable. You HAVE TO have these for hiking the Narrows. You'll need two of these for your Narrows hike! No, you can't drink the water in the Virgin River, so you'll need to bring your own reliable water pack. Don't forget this! A sunburn is the last thing you'll need while hiking this strenuous section of Zion. If given the opportunity, would you hike the Narrows section of Zion? Springdale lies just outside the park's boundaries on Highway 9 in Southern Utah. This page gives you a good idea of the weather and what to experience throughout the seasons in Zion. Zion has great accomodations around the park, and just one in the park. All of these hotels have decent reviews from customers. 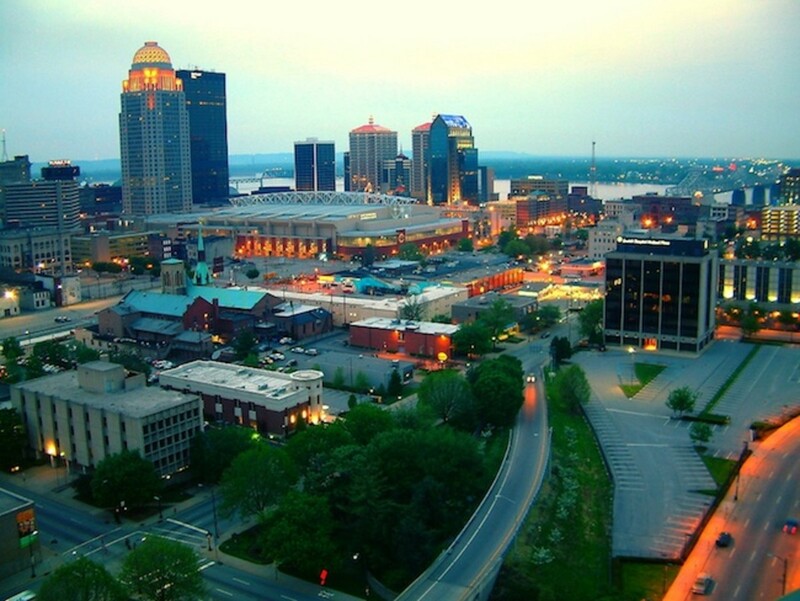 Most of these hotels are also an easy bus ride into the closeby park. The lodging in Springdale, UT, in particular, is very close to the park entrance, and has some spectacular views even outside the park. I've stayed at Cliffrose Lodge and was impressed with the botanical gardens and serene canyon atmosphere! The backyard is a huge oasis of manicured lawn, trees, and gardens, along with the beautiful pool area. It's also very conveniently located to Zion, just a few minutes down the road. The Pioneer Lodge has a great restaurant on location, which has great reviews, along with the hotels. Guests love the hotel for its extraordinary views of Zion, the convenience and proximity to the park, and the clean, comfortable rooms. The great rooms at Bumblerry Inn are quiet, serene, and close to the park. Located in Springdale, this area has much to do after your long days of hiking and sightseeing in the Canyon. The only accomodations within the park. Remember, it's location, location, location! While this lodge may not be all that fancy, you'll have all day and night to enjoy the beautiful surroundings of Zion. Just around 7 miles from the park entrance in Orderville on Highway 89, you can find the conveniently located Best Western Thunderbird. Located just 1/2 mile from the park entrance, this clean and dependable hotel also affords the dramatic scenery leading into Zion all around you. A year round eco resort with a classic park lodge atmosphere, the on site Spotted Dog Cafe is a great place to dine and unwind (there was a really interesting menu when I visited!). The Days Inn in Hurricane offers a budget friendly alternative, around 20 miles from the park, which lies to the east. Another prime location in Springdale, right outside the park, with a steakhouse and gift shop right on site! Find more lodging and accomodations in the Zion area. 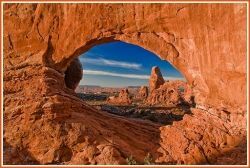 More Lenses in the Grand Circle: - Visit America's Southwest! Bryce Canyon National ParkBryce Canyon is located in the southwestern portion of Utah, and is home to the famous red and white hoodoos spire formations, with remarkable hiking trails and scenic opportunities. Capitol Reef National ParkA 70 mile wrinkle in the earth's crust resulted in the massive Capitol Reef area and National Park. Giant sandstone domes line the tops of this beautiful Utah plateau. Canyonlands National ParkWind and water carved stone resulted in the area near Arches known as Canyonlands. 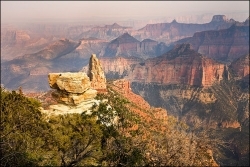 The area boasts impressive, wide canyons, unique desert wildlife, and unmatched hiking. Zion National ParkThe majestic Zion region has been eroded over time by the Virgin River, which slims down to the challenging hiking area of the Narrows. Mesa Verde National ParkRemnants of a long lost culture can be found in the Colorado ruins of Mesa Verde National Park. Visit to gaze upon the incredible Puebloan Cliff Palace and ancient petroglyphs. 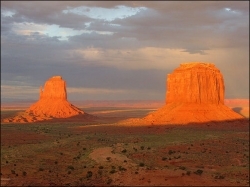 Monument ValleyDeep in the four corners region of the southwest is the often filmed Monument Valley reservation area. 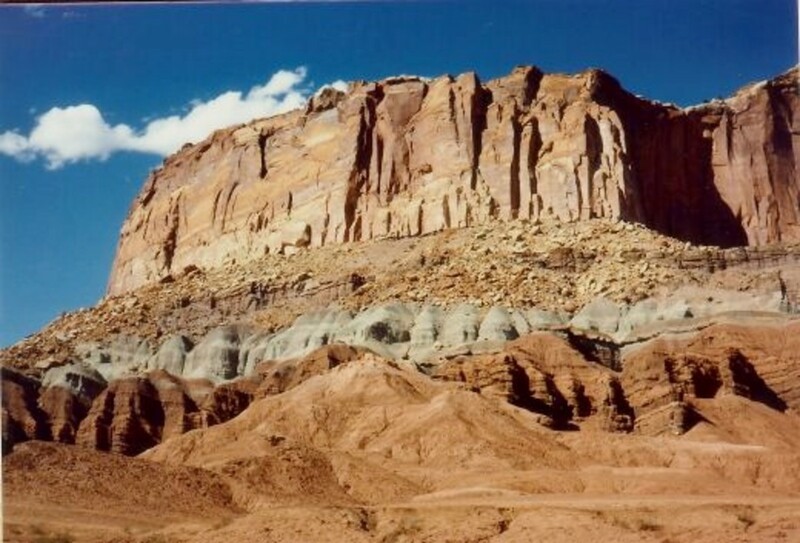 Now under the rule of the Navajo tribe, the area is open for touring, hiking and photography. Arches National ParkSee the most natural sandstone arches anywhere in the world in Arches National Park of Moab, Utah. Erosion has left thousands of these unique stone structures standing in the park. 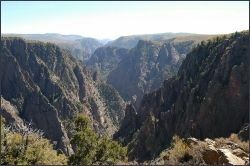 Black Canyon of the GunnisonDeep, black canyons leave a lasting impression in Colorado's Black Canyon of the Gunnison, with an impressive 2700 foot drop over into the Gunnison River. Great Basin National ParkGreat Basin National Park contains the beautiful underground Lehman's Cave, and the mammoth peak of Mount Wheeler. Hike the area from its 13,000 feet peak, to beneath the earth's surface. The Grand CanyonThe Grand Canyon is one of the wonders of the world, with an unforgettable hiking, photography, and road trip experience. * Read more Squidoo Lenses by Kiwisoutback! * Sign up for Squidoo and Make a Lens! Have You Been to Zion? Tell Us About Your Trip! - Recommend a trail, what to bring, a local hotel, or route! @Pat Goltz: It's a great place. The Narrows and the Virgin River valley are really something to see. I went to Zion twice. The first time was as a teenager, and I didn't have a camera with me. I remember the chipmunks in the tunnel. The second time, I had a camera, but it was rainy and foggy and not at all pleasant, so to get the really colorful and spectacular views, I will need to go back. Your lens will help me plan my trip. This is on my list. 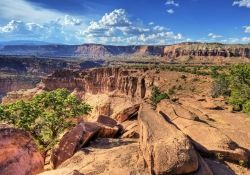 I can't believe I haven't visited the Utah parks yet! I so loved Zion. Thanks for the quick trip down memory lane. The images you selected were beautiful! I grew up near Zion and have many wonderful memories of it. There is an amazing hike in the back-country called the subway that is my favorite of all! I also highly recommend dining at the Bit and Spur. Thanks for a great lens! We like to visit Zion during the winter season for two weeks at a time. The lodge in the park changes almost half as much and the park is really quiet. Wow, I definitely going to visit next time I'm going that direction, thank you for great info! I got to visit Zion's when I was a teenager. I want to go back again. Thanks for this beautiful lens. 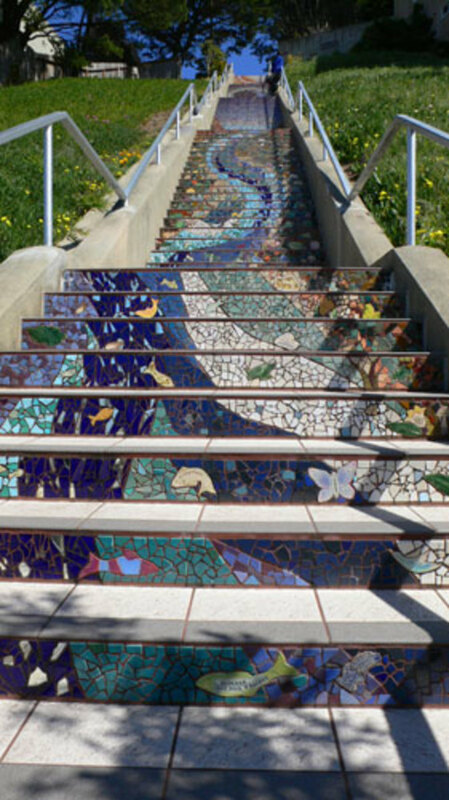 Awesome lens about a wondrous park -- blessed by a SquidAngel! I was lucky enough to work for 8 days in Zion, absolutely beautiful place! Wonderful lens! Great lens. I love the pics! I've never been to Zion, but you have inspired me to make that trip. Maybe this summer. Thanks. I visited Zion last year, and it's now one of my favorite National Parks. It was so beautiful! And I think it would be amazing to hike The Narrows. Lensrolled this to my National Parks #51-58 lens. Looks like one amazing place to visit. 5***** for another great lens. 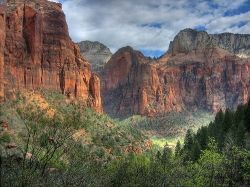 Lots of great information for anyone planning a trip to Zion National Park. So much to see! Thank you for joining us on A Walk in the Woods and don't forget to add your lens to the appropriate plexo. wonderful lens about a really wonderful place. 5* and added to ny Natural Wonder lens. Excellent lens. Squid Angel Blessings to you for another well researched informative lens. Fantastic lens, chockful of info about one of my favorite National Parks as well. In fact, we go up there (from here in Flagstaff) two or three times a year, usually right around Thanksgiving and again around Easter, which is what we'll be doing the week AFTER Easter this year. (A little less crowded the following weekend.) With all the hiking we've done up there, we've yet to do the Narrows, other than walking up it a couple of miles. It's on the list! Anyhow, great job on this lens and, as usual, lensrolling it to mine about hiking the Grand Canyon. Wonderful lens. I was in Zion National park once, but didn't have nearly enough time to see everything, I would love to go back!